There is some debate as to just who was responsible for the old golfing adage that 'the harder I practice, the luckier I get' but it is certainly something Linfield boss David Healy would adhere to. They may not be winning too many beauty contests or popularity competitions at the moment, but what they are doing is mercilessly stacking up win after win. The League Cup already safely in the trophy cabinet after a 1-0 defeat of Ballymena United a fortnight ago, the Blues followed that up with another win by the same scoreline over the Braidmen last Saturday and on Tuesday night edged past Newry City, yep, you guessed, with a 1-0 win. It wasn't pretty but at this stage of the season it doesn't have to be and Healy himself admitted that he was braced to go home and watch a video nasty after that win on Tuesday that put them nine points ahead of Ballymena with eight games to go. "I probably won't sleep much tonight," Healy said. "I will go home and watch the game back. I will run through the game and pick out the good and bad parts. I might not like what I saw tonight, though. "The players will then get edited highlights to look back on, and that's when you hope they learn. "But I will watch it all back tonight. I can't imagine too much sleep happening." There is a certain irony that a man who became a hero to a generation of fans for his goalscoring exploits in a green shirt at Windsor Park now basks in the glory of frugal defending. That win on Tuesday, thanks to one of the season's stand-out players, Chris Casement, was their 22nd clean sheet in 40 domestic games this season. And in the Danske Bank Premiership they have recorded 17 blanks in 30 games, only allowing in 29 goals in total. To put that in perspective, the next best miserly stat is Ballymena who have let in 37 goals in the league to date. The Blues set the record (24 goals in 38 games) for the current 12-team set-up back in 2017 when they last won the title and in the last four games, those three 1-0 wins following a come from behind 3-2 success over Coleraine, they have ridden their luck at times, but 'lucky Linfield' is hard to stand up. Their defensive record is all the more remarkable given that it has largely been achieved without Mark Haughey and Mark Stafford, new signing Ryan McGivern finally made his debut at the weekend after his injury hell and everyone expected them to crumble when goalkeeper Roy Carroll was ruled out for the rest of the season. Gareth Deane has been exceptional in filling his gloves, while the likes of Josh Robinson, Jimmy Callacher and Casement have been awesome all season. But while they have had the rub of the green at times, there is no denying their spirit, Casement's last-gasp winner and coming from 2-0 down to win 3-2 against the Bannsiders a case in point. "They weren't satisfied with a 0-0 draw and they battled for the win," added Healy. "But I take a lot of satisfaction out of winning so late in the game. We did something similar against Coleraine three weeks ago, and that says a lot about the hunger of the players." And as for that 'lucky Linfield' tag? Well, it's lucky that Healy hasn't taken it to heart. "Apparently we are the team that gets all the lucky decisions - we are the team that gets the lucky breaks," he said on Saturday. "But we are the team that has kept 21 clean sheets in 39 games. So hopefully our luck holds until the end of the season." Their luck didn't run to the Irish Cup, which they sit out this weekend having been ousted by Crusaders in the last round, but with the League Cup already scooped, a Co Antrim Shield final to come and one blue ribbon already on the Gibson Cup, a rest will be good for change on Saturday. So whether it's luck or pluck, Healy probably doesn't give a jot. Another week and more refereeing controversies but some help may be at hand with talk that the IFA are looking at ways of introducing Video Assistant Referees (VAR) into the local game. That will be of little solace to David Jeffrey, the Ballymena United manager furious at referee Tim Marshall's decision not to award a late penalty that could have earned his side a share of the spoils against Linfield on Saturday. Most onlookers and the Irish League Show's panel certainly felt Jimmy Callacher blocked Adam Lecky's shot with his hand and Jeffrey was in no doubt. "How does that come about? The inconsistency level between referees is dreadful," he said. "Unfortunately there are some things that I have no control over and that includes the performance of the referee and we were denied a stonewall penalty." As was Ards' Mark Kelly, who scored twice to give Warren Feeney a dream start against Newry City on Saturday but was clearly hauled down in the box. Again, referee Steven Gregg waved play on. No such problems with Keith Kennedy though, who gave three spot-kicks in the space of five minutes up at Coleraine, two of them sent over the bar before former Derry GAA star Eoin Bradley hammered home to secure a 1-2 to 0-0 win over Dungannon Swifts. The irony was that of all those given the only one that was scored was probably the least convincing shout of them all. We all know that VAR won't come cheap, but that's what all those millions in the vaults of Fifa should be used for. As I've said before, can we afford not to pay to make our game the best it can be? What a momentous couple of weeks it promises to be for Larne Football Club. The Championship was all but clinched last Saturday at the Welders while work continued furiously on the new stand at Inver Park to house Coleraine fans for tomorrow night’s Irish Cup quarter-final. That game will also be screened live on BBC NI and I know Purplebricks have been the key players, but the fans must be black and blue at having to pinch themselves so often. With Kenny Bruce’s cash and the drive of chairman Gareth Clements and his merry band, the progress has been incredible and they will be a breath of fresh air in the top division unless there is a collapse of Devon Loch-type proportions. The new stand at the Bleach Green end of the ground is another step in what will be a superb arena when it is finished, housing around 700 fans, although being Larne they’ll need to put a roof on it at some stage. The following Saturday they play host to Ballinamallard United and only need a point to finally confirm the title, but it is now merely a matter of time before they’re back in the big time. 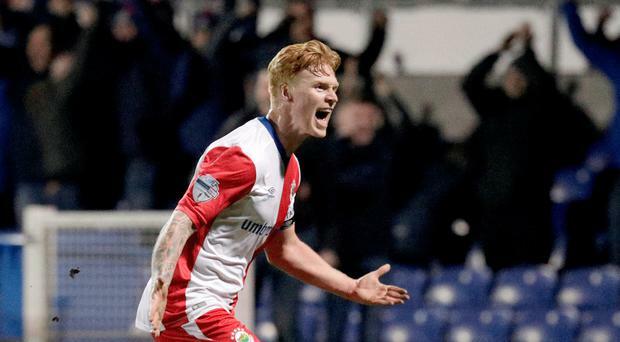 And so another Irish League player has apparently been caught betting against his own team, this time an Institute player who is alleged to have backed Ballymena United when the teams played at the Brandywell. Sometimes you have to wonder about how stupid some players can be. I mean, it’s not as if there haven’t been enough stories in the past to hint to them that this isn’t really the done thing. Personally, I have no real qualms with players betting on their own team, as long as it is to win and that be the end of it, but once you get into score predictions and the likes you are opening a huge can of wriggling things. It is part of the culture of the game, like it or not, and can be a terrible disease for some, but I’ll finish with a light-hearted story to show that it isn’t all bad. You don’t get that in the Premier League! But will this latest incident be the last betting controversy in the local game? I reckon you would get good odds on that.